Cook dal in water till it becomes soft. Drain the water and keep the dal aside. Heat oil in a kadhai and temper mustard seeds. Add broken red chilies, cloves, cinnamon, cardamom, cumin seeds and fenugreek seeds. Saute a while and add chopped onions. Fry till it turns golden brown. Add ginger-garlic paste and tomato paste. Mix well. Add chopped ridge gourd, cooked dal, turmeric powder, asofoetida and salt to taste. Add enough water and cook it covered for 10-15 mins. 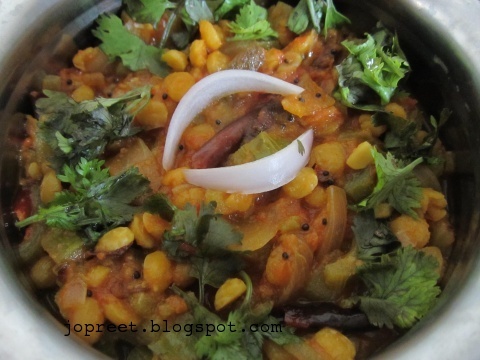 Garnish with chopped coriander and serve hot with rasam rice or plain rice. 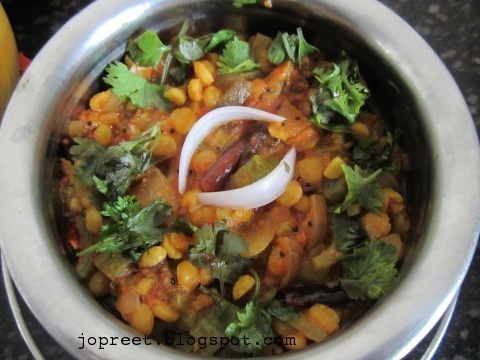 looks delicious and easy kootu..
We have a similar Sindhi dish with Ridge gourd and chana dal..but that is not spicy. Simply delicious and tempting. Looks great.